Tifferz & Her Sisterz Book Reviewz: New Release Giveaway with Cheree Aslop!!!! 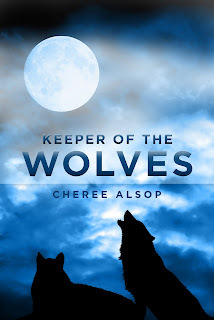 New Release Giveaway with Cheree Aslop!!!! Victus, a wolf forced to change to the form of a man in the moonlight, lost everything the night he was captured. Caged and beaten, he quickly learned the darkest depths of the human soul. But when blue eyes and a soft smile threatened to steal his heart along with freeing him, he was torn between two worlds. Victus has to decide if he can trust his fierce instincts to protect the girl, or if he should run away with the wolf pack whose loyalty kept him alive. When a terror appears that threatens to destroy them all, Victus’ decision may be the only thing that can protect those he cares about. A true love story, Keeper of the Wolves takes love and sacrifice to a new level. Victus faces the ultimate truth: in finding love, one must truly be prepared to put everything on the line in order to not lose it again. Winners of the Cheree Alsop Giveaway!